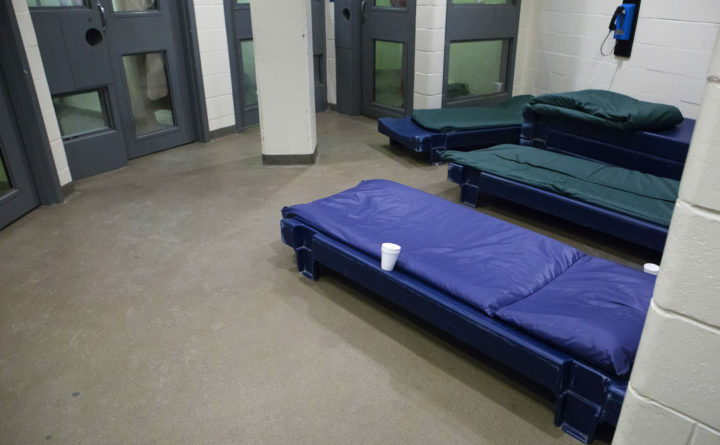 Inmates wait in holding at the Penobscot County Jail in Bangor in this Feb. 12, 2015, file photo. A legislative committee on Friday strategically killed a bundle of bills that aimed to increase state funding for Maine’s county jails, but the effort to solve the county jail funding crisis is far from dead. The reason why the Criminal Justice and Public Safety Committee unanimously voted “ought not to pass” on six bills, said House Committee Chair Charlotte Warren, D-Hallowell, was so committee members can convene a work group and fashion a bill together after the first legislative session adjourns. The group, which will begin early next year, will include relevant stakeholders, including county commissioners, and representatives from the Maine Sheriffs’ Association and Department of Corrections. Warren said the collaborative approach on her bill to stabilize county corrections funding could provide the first real solution to a problem many in corrections first sounded the alarm on years ago. Cumberland County Sheriff and Maine Sheriffs’ Association President Kevin Joyce thinks so, too. “This is different, and it’s because the Maine Sheriffs’ Association has decided we can’t keep going in, year after year, asking for money without developing a plan,” Joyce said. The state’s county jail system has had trouble since at least 2006, when a failed state takeover of the system by former Gov. John Baldacci, a Democrat, led to the enactment of a law that capped what taxpayers had to pay for county jails. In 2007, oversight of county jails was transferred from counties to the state Board of Corrections, but capacity issues and funding shortages continued. The board eventually dissolved after former Gov. Paul LePage, a Republican, refused to appoint new members and vetoed a bill — which was overridden by the Legislature — in 2014 to address county jail funding formula shortfalls. Meanwhile, jail operating costs continued to rise while state aid remained flat. LePage refused to offer assistance until 2015, when a looming fiscal crisis forced him and lawmakers to give $2.5 million in emergency funding to all of Maine’s 15 county jails, some of which were struggling to maintain normal operations. Conditions have whipsawed since, and as recently as last February, the Department of Corrections announced it would be closing five of the state’s jails for lack of adequate funding. In July, lawmakers again overrode a LePage veto to provide another multimillion-dollar emergency supplemental funding package. Today, property taxpayers cover roughly 80 percent of the approximately $90 million cost, and the state pays the rest — a funding formula that some county jails can still barely swing, depending on other hardships and the financial outlook year to year. Gov. Janet Mills stuck with that ratio in her two-year budget, proposing to give county jails $18.4 million from the state annually. “At this point, we’ve cut as much as we possibly can,” Joyce said. Though Cumberland County is in better shape than most, simply because it has the capacity to reap the financial benefits from housing federal inmates, others — including the Penobscot County Jail in Bangor — are at or over capacity and struggling to make ends meet. That’s why all parties are coming to the table to build a solution that, in addition to stabilizing funding, will re-examine the state’s standards for incarceration in order to cut costs, and to shorten certain jail stays and ultimately reduce recidivism.